The ultimate in contemporary wall decor, this 30″ x 40″ masterpiece is created using 12 of your favorite images from your special event. 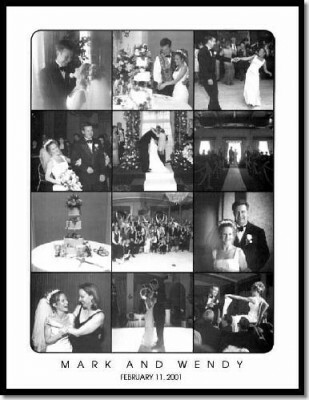 All of the images are printed in elegant black and white, with your names and event date at the bottom. Delivered to you framed in black aluminum and non-glare plexiglass, the Fine Art Poster is truly a striking visual statement about the two of you and your experience!